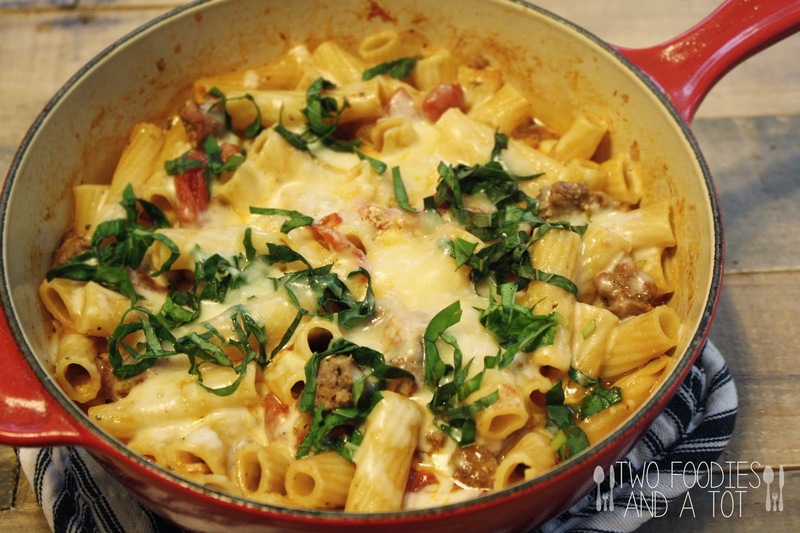 When in doubt, make one skillet pasta! Sometimes I am very prepared for meals with plans way ahead. Sometimes, my day just goes so quickly that I would only try to decide what to cook for dinner half hour before dinner time. 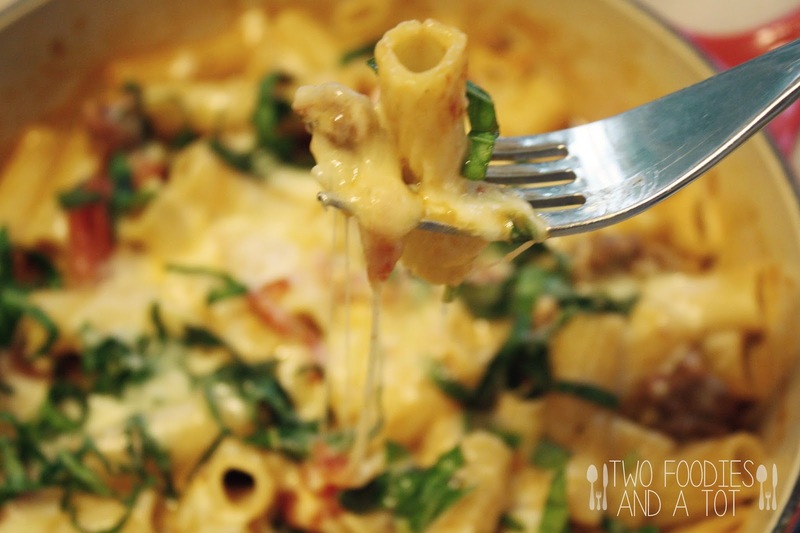 Then one skillet pasta comes to rescue me and it's always a hit. 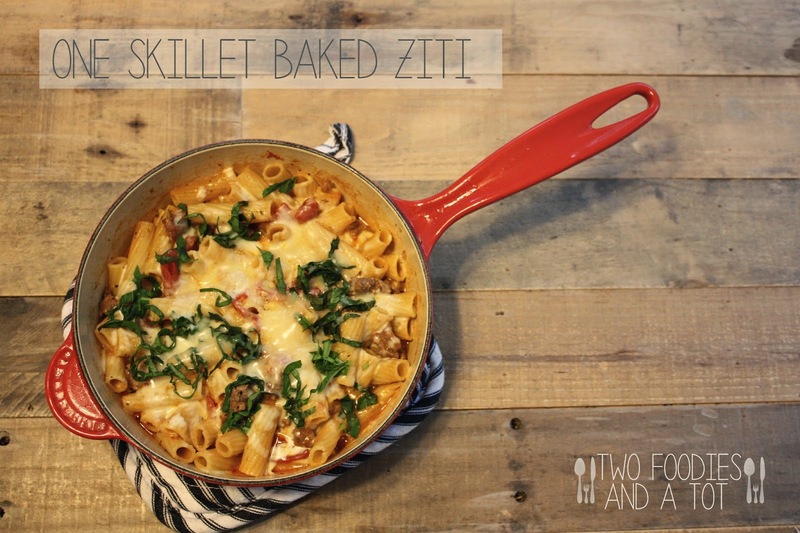 "Baked ziti" is one version of them. You can basically add whatever you like and pasta to liquid ratio is usually 1:3. And the fact that I don't have to wash more than one pot is fabulous. Enough reason for me to be obsessed with all kinds of one skillet pasta dishes. =P Original recipe for this one used water but I find stock a lot more flavorful as pasta absorbs all the flavor while simmering. But if you don't have stock handy, it's not THAT big of a deal. 1. Heat the olive oil and brown the sausage while crumbling it as it cooks. (3-5 mins) Add garlic and red pepper flakes. 2. Stir in pasta, chicken stock(or water), and crushed tomatoes. Bring it to a boil then cover and simmer for 15 minutes. Add salt and pepper to taste. 3. Remove from heat, stir in cream and Parmesan cheese. Top with mozzarella and cover until cheese is all melted. Garnish with basil and serve.